With its luscious and lascivious title, Nymphetamine finds England's Cradle Of Filth concurrently pushing forward its particular brand of black/gothic metal and hearkening back to its roots, perhaps as far back as 1996's seminal Dusk... And Her Embrace. The end result is powerful, symphonic, and as always, compelling. Interestingly, Cradle Of Filth has been nominated for a 2005 Grammy for 'best metal performance'. The band's core remains vocalist Dani Filth, who through the years has lost some of his power. On Nymphetamine, Dani turns in a solid performance, his demonic screeches considerably stronger than on Bitter Suites To Succubi. Guitarists Paul Allender and James McIlroy assert their presence, churning out an array of blistering riffs and howling hooks. 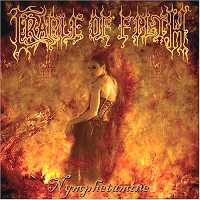 Keyboardist Martin Foul gives Cradle Of Filth its symphonic underpinnings while bassist David Pybus and drummer Adrian Erlandsson bestow upon the band its inherent power and sense of menace. As with everything 'Filth', the bombastic elements continue to thrive. On this outing, the band recruited actor Doug Bradley (Hellraiser) to record several key narratives, Liv Kristine (Theatre Of Tragedy and now with Leaves' Eyes) to provide succulent counterpoint vocals (along with Filth veteran Sarah Jezebel Deva), and the Bulgarian Philharmonic Orchestra to supply the symphonic overload. With its tightly crafted lyrics (complete with a 'Call to Cthulhu' on the track Mother Of Abominations), heavy production, and stellar performances, Nymphetamine demonstrates that undead blood continues to flow through Cradle Of Filth. Listeners disappointed by Damnation And A Day should take a chance with Nymphetamine.